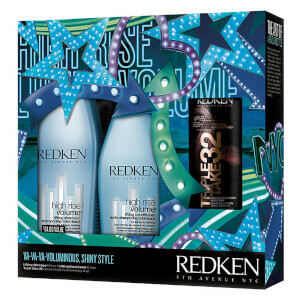 Treat frazzled and unruly hair to the Frizz-Free Obsessed Frizz Dismiss Duo from Redken. Suitable for all hair types, from fine to coarse, the pair work in tandem to help you achieve calm, manageable and sleek locks with every use. Suitable for all hair types, the shampoo gently eliminates dirt, impurities and excess oil from the hair and scalp, whilst penetrating deeply into the hair shaft to maintain moisture levels. Enriched with Brazilian pracaxi oil, the lightweight shampoo nourishes and strengthens fibres and its Humidity-Resist Complex delivers protection for calm, manageable locks. Achieve a smooth, salon-style finish with the Redken Frizz Dismiss Conditioner; a weightless formula that works to restore sleek, calm and manageable locks from root to tip. Harnessing the powers of Brazilian Pracaxi Oil and an innovative Humidity-Resist Complex, the tames unruly, hard-to-control hair, whilst nourishing and strengthening to reveal sleek, healthy-looking tresses. Hair is moisturized and hydrated with lasting frizz control. Shampoo: Apply to wet hair and massage into a lather. Rinse thoroughly. Conditioner: After shampooing, apply and distribute through hair. Rinse thoroughly. Shampoo: Aqua/Water/Eau, Sodium Cocoyl Isethionate, Disodium Laureth Sulfosuccinate, Cocamidopropyl Betaine, Glycol Distearate Glycereth-26, Decyl Glucoside, Hydrogenated Coconut Acid, Parfum/Fragrance, PPG-5-Ceteth-20, Divinyldimethicone/Dimethicone Copolymer, PEG-55 Propylene Glycol Oleate, Propylene Glycol, Polyquaternium-7, Amodimethicone, Sodium Chloride, Polyquaternium-10, Sodium Isethionate, Carbomer, C11-15 Pareth-7, Benzoic Acid, PEG/PPG/Polybutylene Glycol 8/5/3 Glycerin Disodium Edta, Laureth-9, Sodium Hydroxide, Glycerin, BHT, Hexyl Cinnamal, Orbignya Oleifera Seed Oil, Pentaclethra Macroloba Oil/Pentaclethra Macroloba Seed Oil, Trideceth-12, Sodium Benzoate, C12-13 Pareth-3, Alpha-Isomethyl Ionone, Methylchloroisothiazolinone, Methylisothiazolinone, Citric Acid (B169816/1). Conditioner: Aqua/Water/Eau, Cetearyl Alcohol, Behentrimonium Chloride, Paraffinum Liquidum/Mineral Oil/ Huile Minerale, Orbignya Oleifera Seed Oil, Parfum/ Fragrance, Isopropyl Alcohol, Glycerin, Phenoxyethanol, PEG/PPG/Polybutylene Glycol-8/5/3 Glycerin, Pentaclethra Macroloba Oil/Pentaclethra Macroloba Seed Oil, Hexyl Cinnamal, Bht, Chlorhexidine Digluconate, Citric Acid, Alpha-Isomethyl Ionone.